In the last year and a half a lot has been written about Putin and his interference in our elections, Brexit and other Western country’s affairs; but not much was written about how Russians relate to Putin. Mostly because we think that it’s an internal Russian matter and we don’t care. I suggest that we should take a closer look at this relationship for some clues about how Putin’s domestic standing and his relationship with Russians affects the direction of his foreign policy. It has now been close to 20 years since Putin came to power. By the end of his current term he will be in power longer than Stalin. Are Russians married to Putin, till death do they part? How happy are these relationships? Surprisingly, one of the signs of trouble is consistently high support rating among population. It is abnormal for a country, with real freedom of speech, to have such an united opinion over a long period of time. Such high support numbers are normal at the times of crisis; remember the support for Bush Jr. after 9/11? But as the crisis passes; the support usually normalizes. People are different by nature and have different ideas about what government should do and how it should work. Putin’s support stays at over 75% and, in fact, is growing even stronger over time. This continued level of popularity suggests that something is fishy. This is not a modern Russian history essay and the sources where you can read about how Putin became Russia’s president are readily available. I’m not going to concentrate on his KGB background, corruption and mafia connections. Excellent research has been done on this topic by many investigative journalists; my brilliant friend Zarina Zabrisky wrote several well documented articles about that. I will put a few references at the end of the blog where you can find a lot of details on these topics. In this essay, I would like to try to understand the nature of the relationship between Russians and Putin. Just to set the stage, Putin came to power after the fall of the Soviet Union when it’s assets and natural resources were already mostly divided between the oligarchs. Most oligarchs came from the highest echelons of the Communist party. A few of the oligarchs had political ambitions like Mikhail Khodorkovsky, which proved to be a dangerous combination under Putin; they were either killed, jailed or had to leave Russia to seek safety abroad. Putin was rather fortunate in his timing. While the division of great wealth is a violent process, after it gets settled, the violence usually recedes. In Russia, this process was more or less completed by the year 2000. Putin became president for the first time in 1999; at that time the elements of free market had already been introduced to the Russian economy. The West was excited about the opening of a new market and foreign money poured into Russia. In conjunction with high oil prices, these factors gave a strong boost to the Russian economy. So, reduced violence, less crime, huge investments in the economy, and the introduction of free market incentives all coincided with the start of the Putin reign. Suddenly, in relatively short time, Russians experienced a huge improvement in the quality of life. They were living better than ever in their long and trying history. Russians, who had lived all of their lives under an authoritarian Soviet economy, didn’t understand the power of free markets and investments in the economy. They attributed their better standard of living, lower crime rates, and more economic opportunities solely to Putin’s leadership; and Putin had no problem taking full credit. Moreover, he used this credit to enforce his position of power. He concentrated on getting rid of any serious political opponents and on the curtailing of free press as the most dangerous enemy for a new leader with authoritarian aspirations. In this media-controlled environment and drastically improved economic conditions, Russians, not surprisingly, developed a trust in Putin’s leadership -- uninterrupted by political opposition and unquestioned by a free press. A free press was an immediate aftermath of the fall of the Soviet Union. Russians, for the first time in history, enjoyed uncensored media. Unfortunately, this didn’t last long. Putin understood the danger very quickly and replaced the most popular independent media outlets with state-controlled entities. Most Russian still consume news from TV and all independent channels were gone within few years of Putin’s leadership. One may think that in the age of the Internet it is impossible to completely shut down a free press.The Internet is indeed wide open to Russians and they are very well connected. There are small independent internet publications and of course bloggers, but their impact is minimal. Very few people will go out of their way to find them. As an occasional blogger myself, I know that their voices are barely heard. The same goes for Western media; not many people know a foreign language well enough to read New York Times. The media cleansing happened a long time ago and the older generation of Russians have forgotten about it, while the younger generation doesn’t even know that it ever existed. The last independent TV station was taken off the air 15 years ago. The state-controlled TV news programs are well produced, entertaining, and seem to present a variety of opinions but within well-controlled range. Majority of people are not aware that they consume well-design propaganda. (see Imitation Game reference for details of how this is done) The Propaganda in Russia is the form of art and could be compared to ballet in terms of traditions and craftsmanship. Putin was educated in the elite Soviet University and his 16 years of KGB service has made him a propaganda master. To manipulate people into believing that they have unrestricted access to the world’s press there are several internet publications which provide a media overview translated into Russian. They include some well-respected news sources from around the world including American New York Times and The Atlantic. However, the selection of translated articles has a clear purpose to present Russia as victim of the world unfair treatment. To an observant and experienced reader, the subtly controlled media environment serves three important messages. The first message is very obvious. It could be summarized as Russian progress in terms of economy, culture and standing in the world. People assume and credit this to Putin’s leadership. As I mentioned earlier, this narrative is believable since within a short time, life became so much better. The younger generation of Russians grew up with this message and became proud and self-confident. This message underlines that this prosperity happened in the background of Russia surrounded by enemies and sanctions. The world’s animosity towards Russia is explained by the fact that other countries don’t want to see Russia growing strong to compete with them. The second message is the Russia as a victim narrative. Victimization is an important aspect of propaganda. It explains all of the Russian neighborhood wars (Georgia and Ukraine) and NATO encroaching on the Russian borders. The narrative is based on the constant repetition of the well-fitting facts while completely ignoring the facts which don’t fit. It never mentions that Russia’s Western neighbors were scared of the imperial neighbor because they had suffered a long history of aggression and annexation by Russia and begged the NATO to be accepted and protected. The most important and the most dangerous of Putin’s messages is about democracy. Real democracy assumes real freedom of press and real political opponents. It is also the greatest threat to Putin’s rule. Putin works hard to eliminate this from Russian life. Democracies are messy and difficult. They require an engaged and educated populace and they can fail. Educated people who live in democratic countries are aware of these vulnerabilities. Putin gaslights the fact that these vulnerabilities are well known and that people have a certain self-awareness of the intrinsic problems with the democratic form of government. He also doesn’t mention the good record democratic countries have for quality of life of their citizens. The anti-democratic narrative promotes the message of Russia’s new strength by taking free market, wealth of natural resources, ingenuity of Russian people as given, while emphasizing the brilliance of Putin’s leadership. The message promotes specific periods of Russian history under certain tsars, and under Stalin when Russia had a critical role in the world’s affairs. The periods when Russia was governed by strong authoritarian leaders which lead Russia to real or perceived greatness. The greatness Russia always deserved but never quite achieved. You may have noticed when we talk about Putin we talk about narratives. The choice of this word is intentional. Putin develops narratives, disseminate them through Kremlin controlled media and he delivers them to Russians himself. He talks with Russians on a live TV program. He speaks in calm and confident voice, complete sentences and delivers believable stories. He tells the stories which people like to hear. He answers questions from audience in a setup so believable that the viewers don’t suspect that Q and A session was well-prepared in advance. When you listen to him he sounds competent and as somebody you can trust. And most Russians do. Going back to the relationship, you can see how Putin manages to stay married to Russians; just like an abusive and manipulative spouse. He controls the message. He has convinced Russians that he is not replaceable. He removes any serious competitors and makes Russians to believe that he is the best leader that they could ever dream of. Nobody loves them as much as he does and nobody works for them as hard as he does. By no means it is our job to divorce Russians from Putin. But we need to understand that in this relationship majority of Russian people are victims of artful manipulation. Russians have no idea that the anti-democratic propaganda, support for nationalistic and separatist movements, the cyber war, the social media campaigns are coming from Kremlin. This presented to Russians as part of the “Russia as victim” narrative. They lead to believe Western countries paint Putin as evil manipulator. In case of Trump it is a witch hunt for the first ever US President who loves and respects their favorite leader.They don’t see Putin covert support for most authoritarian and destructive movements in Europe and the US. Instead they are told that these movements are evidence of the failure of democracy. This is why the destabilization of the Western democracies is an important goal not just for Putin’s foreign policy, but is also central to his domestic policy. 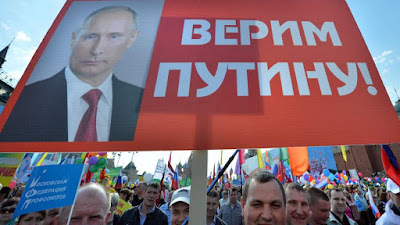 It is crucial for Putin to maintain his firm grip on power in Russia. He must prove to Russians they don’t need democracy and they are lucky to have the best government and the best and the strongest leader in the world. A leader who cannot survive without their love and loyal support.